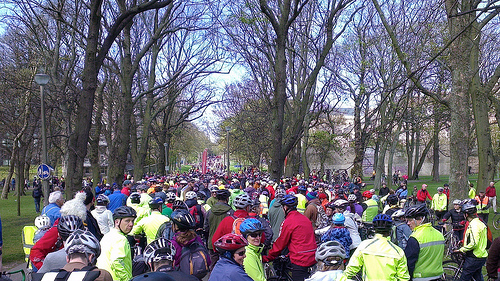 Not only the biggest ever cycling demonstration in Scotland, but MSPs told us it was probably the biggest ever demonstration on any subject to take place in the public arena outside the Scottish Parliament. Pedal on Parliament was fantastic, and the organisers deserve huge thanks from everyone who wants conditions that feel truly safe and welcoming for getting about by bike. 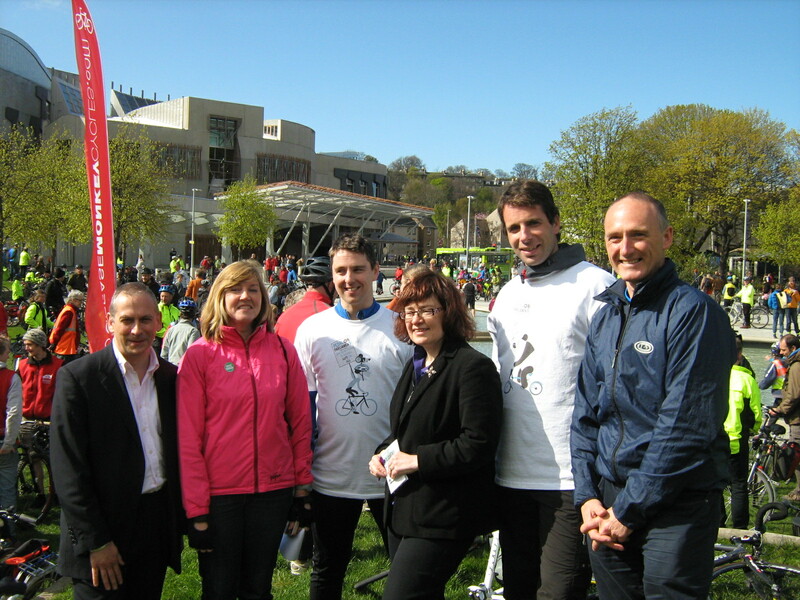 You can see literally 100s of pictures on the PoPScotland flickr site. You can find some particularly relevant to Spokes here (see the captions for more info). One picture [also below] shows all the politicians who spoke, with brief notes on each in the caption. Sign the PoP manifesto petition. It will be formally presented to the Parliament in a few weeks, so it’s not too late. Ask all concerned friends, family and colleagues to do the same. Take part in the Local Elections on May 3. Check out party manifestos [this link is Edinburgh manifestos only] and check out your local candidates. Vote on May 3. Our advice, in italics, has been endorsed by a member of the Electoral Reform Society: You number the candidates in your preferred order, 1,2,3, etc. For your vote to have maximum effect, number every candidate. Enjoy putting your least favourite candidate last as well as your best first. [NB: This advice does assume you know at least something about all candidates/parties, so you can put them in order. If you know nothing at all about some, try to find out. Otherwise just slot them in between those you’d be content to see elected and those that you’d hate to be elected]. If you’re not a Spokes member, join Spokes! Our 3-a-year Bulletin and our roughly-monthly email circulars to members aim to keep telling you when is a useful time to contact who about what – politicians continually tell us that emails, letters and visits from individual voters really matter. They are much more likely to listen to Spokes, PoP etc if they are also hearing from you!! And lots more blogs/videos linked from the PoP website.